After being forced to leave his home in the US to get urgent surgery, Ceferino will finally be able to return to his community. Claudia will finally be able to come home to the place where she grew up, and live here in safety with her mother and U.S. citizen son. After growing up in North Carolina, Luis attempted to come home 4 times. Now he will finally be able to reunite with his family. Adriana came to the US when she was 4 months old. Now she will be able to come home to the place she has lived for her entire life. Maria left the U.S. just 3 days before DACA was announced. Now she will be able to come home and reunite with her community. Mario will be able to come home, and will be safe from the violent threats he received after witnessing a crime. Obviously, there is still work to be done. The DREAM 9 have to win either humanitarian parole, asylum or stays of removal in the United States as they still face removal proceedings. But for now, we rejoice. We rejoice the hard work, courage and vision of our friends — Lizbeth Mateo, Lulu Martinez and Marco Saavedra — who, out of tremendous love, left the country, put their bodies and lives on the line, to bring back other Dreamers who had been previously deported or forced to leave. 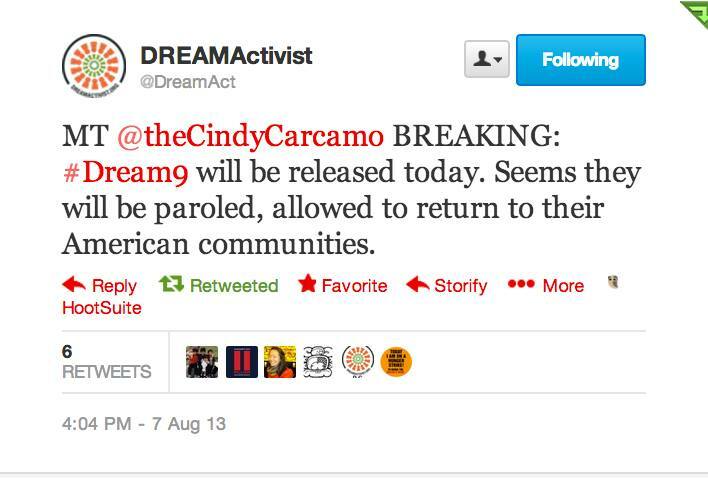 And we rejoice our mammoth community of supporters who signed petitions, made calls, tweeted, participated in hunger strikes, wrote letters to the DREAM 9, engaged in media wars, lobbied Congresspersons, sat down in various different offices, got arrested for the release of the DREAM 9. Contrary to media hype, the DREAM 9 UNITED the immigrant rights movement — every undocumented-led organization signed on in support of bringing them back home where they belong. Together, we can #BRINGTHEMHOME and reunite our families.